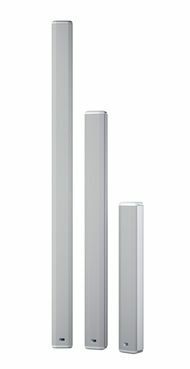 Meyer Sound has begun delivery of its CAL column array loudspeaker this summer. Available in three models, CAL is a self-powered installation product designed to bring vocal clarity to even the most reverberant environments. The recipients of the first shipments include a collegiate stadium and an indoor auditorium in the U.S. as well as an Australian live performing arts centre. "CAL is a digitally steerable column array product in which all high-frequency and low-frequency drivers are tight-packed in a bi-amped configuration and are individually amplified and processed," said John McMahon, executive director of operations and digital products at Meyer Sound. "These engineering details are essential in enabling the beam control needed for a human voice to cut through a highly reverberant acoustic space." CAL's vertical beam can be angled up or down in one-degree increments up to 30 degrees to aim only at target coverage areas without exciting an entire architectural space. Two of the CAL versions, CAL 64 and CAL 96, also include beam-splitting capabilities for applications where a balcony wall may cause undesired reflections.